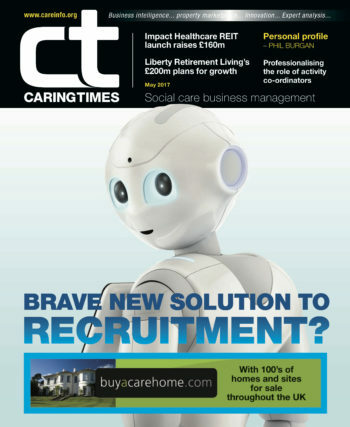 MMCG chairman and chief executive PHIL BURGAN talks to Tim Barsby, Business Development Director at Carter Schwartz, about the ups and downs of building a care home portfolio. Phil Burgan began his working life as a pharmacist, an entrepreneurial pharmacist who built a group of 38 pharmacies in nine years. 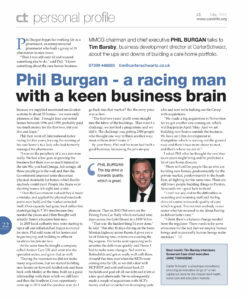 Phil then went off International motor racing for five years, leaving the running of his care home’s to a lady who gad formerly managed his pharmacies. “I was on the periphery of it as a non-exec really. We had a few goes at growing the business but there was so much turmoil in the late 90s; you had Omega, Advantage, all those people go to the wall and then the Government imposed some draconian physical standards for homes which hardly anybody could meet.People like Bupa were shutting homes left right and centre and I think 100,000 beds disappeared, which was 20% of the market. “Then the Government realised they’d made a mistake, and applied the physical standards just to new build and the market corrected itself. Over-capacity had gone, local authorities started giving 6/7/8% fees because they needed the places and I then thought well actually there’s a business here now. In 2005 local authority fees were starting to taper off and inflation had begun to exceed fee rises. Phil sold some of his homes and began buying and building in affluent locations for private fees. At the same time, he bought a company called Autism Care UK and went into the specialist sector, and grew that as well. “By 2010 we had not made many acquisitions, but we started building new homes on forward funded sale and lease back with Medics at the time, built up a good relationship with them which we still have and then the Southern Cross opportunity came up in 2011 and the question was ‘do I go back into that market?’ But the entry price was so low. By year three, Phil and his team had built a good business, increasing the private-pay element. Then in 2013 Phil went on the Peking Paris Car Rally which included nine days across the Gobi Desert in a 1959 Volvo. “That was the hardest thing I’d ever done,” he said. “But after 11 days driving on the trans-Siberian highway across Russia it gives you a lot of thinking time, in between avoiding the big wagons. The banks were squeezing us to amortise the debt more quickly and I knew I had to make some changes. So I went to Rothschilds, got on really well with the. Around that time was when the REITs were coming into the UK, so we did a deal with HCP REIT and sold and leased back 23 freeholds and paid off all our debt and it left us a few quid afterwards. It enabled me to split out Autism Care and subsequently somebody came in for that so we sold that very profitably in 2015 and we’ve subsequently made a couple of acquisitions with HCP’s money and we’ve carried on developing quite a lot and now we’re bulking out the Group with acquisitions. I asked Phil what he thought the next four to six years might bring and he predicted a lot of care home closures. “There will still be people like us who are building new homes, predominantly for the private market, predominantly in the South East, all fighting for the same sites. There are still brave people building things in Preston, Newcastle etc – good luck to them! “I think there’s a balance change needed from the regulator There needs to be some allowance for the fact that we employ human beings and occasionally human beings make mistakes.